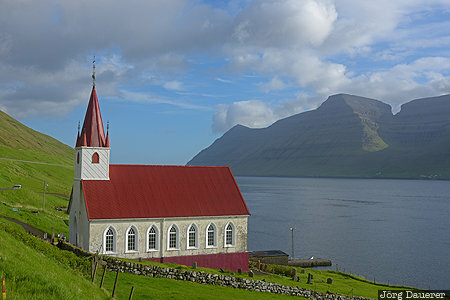 The red-roofed church of Húsar in the south of the island Kalsoy illuminated by warm morning light. Húsar is on the island Kalsoy, Northern Islands, Faroe Islands. This photo was taken in the morning of a sunny day in June of 2017. This photo was taken with a digital camera.